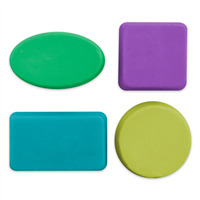 Milky Way® Molds are constructed of plastic and have angled sides for easier soap removal. The dimensions listed are for the largest sides. The bottom of each cavity will be slightly smaller than the dimensions listed. COMMENTS: I find myself using this mold for many things. Love that there's 4 different shapes. COMMENTS: Although I have found that I prefer the silicon molds, this one has come in very handy. The size of the bars are perfect & they are not difficult to unmold, (though not as easy as the silicon molds). I would purchase again. COMMENTS: My 13-year-old was interested in beginning her own soaping hobby, so when she asked for soap supplies for her birthday, this was the first mold I bought her. It's perfect for a beginner, nice and sturdy, enabling her to experiment and become familiar with all the basic shapes and techniques. COMMENTS: This is my go to mold for simple shaped bars. I have a couple of these and I find myself using them a lot. Great quality! COMMENTS: The soap hardens fast, it's easy unmolding, beautiful shapes and it gives me shiny soaps. COMMENTS: This is a great mold. Soap comes right not and makes smooth, shiny bars of soap. COMMENTS: I bought this mold for the variety of shapes it offers. This is a nice quality plastic mold. The inside edge of each cavity is curved, so this mold will not produce sharp edges on the tops of your soaps. COMMENTS: For anyone just starting out, this is a great basic soap mold to begin your M & P adventures with. "Are these plastic or silicone?" Staff Answer This is a plastic Bar mold. "Can you list the dimensions of each mold? I need to know if they will fit in the clamshells I have."